Parliament’s economic affairs committee completed its review of the government’s flagship special economic zone (SEZ) legislation yesterday and sent the bill to the People’s Majlis floor with minor revisions. While Jumhooree Party (JP) and opposition Maldivian Democratic Party (MDP) MPs had boycotted meetings last week, the committee resumed the review process yesterday after JP Leader Gasim Ibrahim assured cooperation for continuing the assessment. However, Gasim and JP MP Abdulla Riyaz reportedly left the meeting later and the bill was voted through with only MPs of the ruling Progressive Party of Maldives (PPM) and coalition partner Maldives Development Alliance (MDA) in attendance. Reflecting its combined 48 seats in the 85-member house, the PPM-MDA coalition has voting majorities on key oversight committees. Among the amendments brought to the draft legislation, a provision was added to include an MP on a 17-member investment board, which would demarcate and oversee the SEZs. JP and MDP MPs had walked out of a committee meeting last week alleging procedural violations by the committee’s chair – PPM MP Abdulla Khaleel – and objecting to his alleged refusal to incorporate recommendations made by various state institutions. The MPs in the minority accused pro-government MPs of deliberately disregarding their input. Khaleel told newspaper Haveeru yesterday that suggestions from state institutions were included to the extent that “the bill’s main concept would not be lost”. MDP MPs did not attend yesterday’s committee meetings. Last week, the main opposition party announced protests against passing the bill in its current form, warning of “dangerous” consequences, contending that it would pave the way for drug trafficking, money laundering, and human trafficking. Meanwhile, at a press conference on Saturday (August 16), PPM Parliamentary Group Leader Ahmed Nihan accused opposition MPs of obstructing implementation of the government’s economic policy. The majority leader urged MDP MPs to respond to technical aspects of the bill in lieu of “misleading” political rhetoric. The government maintains that SEZs with relaxed regulations and tax incentives were necessary both for foreign investors to choose the Maldives over other developing nations and to launch ‘mega projects,’ which President Abdulla Yameen has said would “transform” the economy through diversification and mitigate the reliance on the tourism industry. Yameen has also dismissed concerns with the absence of parliamentary oversight in the legislation – such as requiring parliamentary approval for presidential appointees to the investment board – arguing that that leasing islands or plots of land was the prerogative of the executive and that affairs of governance was outside the Majlis’ mandate. At today’s sitting of parliament, MDP MPs raised consecutive points of order – for nearly half an hour – contending that the committee completed its review with unprecedented and undue haste after ignoring the views of opposition MPs. PPM MPs meanwhile urged Speaker Abdulla Maseeh Mohamed to exercise his authority to expel unruly MPs. However, unable to continue with the day’s agenda, Speaker Abdulla Maseeh Mohamed adjourned proceedings twice. Following the adjournment, the MDP parliamentary group informed the press that its MPs were protesting in the chamber against efforts to “silence” the minority party as well as the fast-tracking of the SEZ bill review despite assurances from the speaker that opposition concerns would be heard. At a press briefing yesterday, MDP MP Ibrahim Shareef said pro-government MPs did not allow opposition MPs to amend the draft legislation and insisted that the review process was conducted “dictatorially” in violation of parliamentary rules. Shareef had warned that MDP MPs were willing to bring Majlis sittings to a halt over the SEZ bill. The MDP has been holding nightly rallies at its haruge (meeting hall) in Malé to protest “openly selling off the country” through SEZs. Following last night’s rally, a group of protesters took to the streets and demonstrated in front of President Yameen’s private residence. The MDP has also launched a petition (Dhivehi) calling on the government to withdraw the SEZ bill, warning that it would “destroy” the decentralisation system as the president could bypass local councils, declare any region an economic zone, and lease land for a period of 99 years. In addition to import duty and tax exemptions for investors, an SEZ law would allow the president to “divide and distribute various regions of the country” to businesses of senior government officials, the party claimed. Moreover, companies with foreign shareholders would be able to purchase land without paying sales tax, the MDP noted, which would pose a threat to national security. “This would be selling off the country’s natural resources dubiously on the cheap for the benefit of a few people,” reads the petition. Political parties in parliament have reached an agreement for the economic affairs committee to resume its review of the governments flagship special economic zone (SEZ) legislation after the Jumhooree Party (JP) and Maldivian Democratic Party (MDP) boycotted proceedings last week. At a meeting held last night to resolve the impasse, JP Leader Gasim Ibrahim reportedly assured cooperation for continuing the review process, explaining that he had walked out in protest of the committee chair refusing to incorporate recommendations from state institutions. The business tycoon said he boycotted Wednesday’s (August 13) meeting after his suggestions to address “one or two issues” in the bill were ignored. Representing the main opposition party, MDP MP Mohamed Aslam insisted that the party’s concerns should also be addressed. If not, Aslam said, the party would “take to the streets” in protest. On Thursday (August 14), the MDP announced protests against passing the bill in its current form, warning of “dangerous” consequences. Further meetings of the committee – where the ruling Progressive Party of Maldives (PPM) and ally Maldives Development Alliance (MDA) have a voting majority – had been cancelled following the boycott. At last night’s meeting, PPM MP Ahmed Ameeth proposed holding a meeting today to approve a timetable to conduct the review process. While MDP MPs voted against it, the proposal was passed with the JP MPs’ support. Subsequently, at the meeting this morning, the committee passed a motion proposed by Ameeth to give authority to the committee’s chair – PPM MP Abdulla Khaleel – to hold meetings every day of the week except Friday to fast-track review of bills. The motion was passed with five votes in favour. While JP MPs Gasim Ibrahim and Abdulla Riyaz voted against the motion, MDP MPs on the committee did not attend today’s meeting. Khaleel has previously declared his intention to complete the review process and send the bill to the Majlis floor for a vote before the end of August. Parliament breaks for a one-month recess at the end of the month. The MDP has meanwhile been holding nightly rallies at its haruge (meeting hall) in Malé to protest “openly selling off the country” through SEZs. Speaking at a rally Thursday night, MP Eva Abdulla objected to the absence of parliamentary oversight in the draft legislation, noting that a 17-member investment board appointed by the president would have the authority to create SEZs. While the president’s nominees to independent institutions required parliamentary approval, Eva noted that parliament would not have a similar confirmation role for endorsing members to the board. As investors would not have to pay import duties or taxes for a 10-year period, Eva contended that the public would not benefit from the SEZs. Investors would also be able to bring in foreign workers under relaxed regulations while companies with foreign shareholders would be able to purchase land without paying privatisation fees or sales tax. In other countries, Eva said, such incentives were offered to investors in exchange for creating job opportunities for locals. At a rally in Addu City on Friday night (August 15), MDP MP Rozaina Adam urged the public to consider why President Abdulla Yameen did not wish for parliament to exercise any oversight despite the PPM’s comfortable majority in the People’s Majlis. The MP For Addu Meedhoo suggested that the president did not want his own party’s MPs to be aware of the “illegal activities” and “massive corruption” that would take place in the SEZs. Responding to the criticism from the opposition, President Yameen told reporters prior to departing for China Thursday night that leasing islands or plots of land was the prerogative of the president or the executive. “Parliament could make rules. That’s why we’re making a law. But after the rules are set, it is not the parliament that would designate the economic zones. Parliament is not concerned with governance,” he argued. Parliament could amend the draft legislation to address shortcomings, Yameen added, suggesting that the president having authority to create SEZs was no cause for concern. On the tax incentives, Yameen contended that resorts were also developed with similar tax exemptions. “Even now, everything brought in for a new resort under development is exempt from [import] duties,” he said. The Maldivian Democratic Party (MDP) has declared its intention to protest against the governments flagship special economic zone (SEZ) legislation, warning that passing the bill would pose serious dangers to the Maldives. “We note that the bill on special economic zones in its current form would allow the government to conduct transactions broadly with no transparency and no opportunity for oversight, as a result of which the possibility of losing the country’s independence and sovereignty would be high,” read a press release from the main opposition party yesterday. The MDP noted that its lawmakers along with Jumhooree Party (JP) MPs boycotted the economic affairs committee yesterday – which was in the process of reviewing the draft legislation – in protest of procedural violations by the committee’s chair and “dictatorial” actions of pro-government MPs. MDP and JP MPs also objected to the economic committee allegedly disregarding recommendations and commentary on the bill sent by various state institutions. Reflecting its combined 48 seats in the 85-member house, the ruling Progressive Party of Maldives and coalition partner Maldives Development Alliance have voting majorities on key parliamentary oversight committees. The MDP press release warned that an SEZ law would allow the government to bypass local councils, declare any region an economic zone, and lease land for any period. The law would undermine the Decentralisation Act and restrict the authority granted by the constitution for local councils to “raise funds,” “own property and incur liabilities,” the party contended. Geographic areas declared an SEZ would be removed from the jurisdiction of local councils. However, Tourism Minister Ahmed Adeeb told Minivan News in June that an SEZ law would encourage further development of tourism outside of the central atolls or the ‘sea plane zone’ – referring to the proximity from Malé’s international airport – and assured that councils would be consulted. “I believe that by doing the SEZ Act, we will bring the investment to these regions and this is the real decentralisation of investments,” he said. The MDP also expressed concern with the tax breaks offered to investors in SEZs, which it argued would limit opportunities for small and medium-sized enterprises. Concessions in the current draft include tax exemptions and relaxed regulations for employing foreign labour. Investors would be exempted from paying either import duties for capital goods or business profit tax, goods and services tax and withholding tax for a period of 10 years. Regulations on foreign workers would be relaxed while companies with foreign shareholders would be allowed to purchase land without paying privatisation fees or sales tax. Article 74 meanwhile allows up to 40 percent of any zone to be tourist-related development with tax and duty exemptions. Moreover, private airports and seaports in the zones would be outside the jurisdiction of the Maldives Customs Service. The enactment of an SEZ law would pave the way for “dangerous and serious crimes,” the MDP press statement continued, such as drug trafficking, money laundering, and human trafficking. Former President Mohamed Nasheed had dubbed the legislation the ‘Artur Brothers bill’, referring to an infamous pair of Armenians linked with money laundering and drug trafficking who made headlines last year after they were photographed with cabinet ministers. 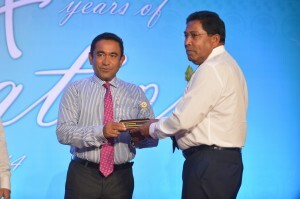 Referring to the opposition to his administration’s public-private partnership projects on religious and nationalistic grounds – with opposition parties accusing the government of “selling off state assets” – in a speech at an MDP event on Tuesday night (August 12), Nasheed argued that the current administration’s economic policies were far worse judging by their terms. “There could be no bigger deception of the Maldivian people,” he said. Nasheed also contended that Maldivian law would not be enforced in the SEZs, claiming that gambling would be allowed in the zones. President Abdulla Yameen meanwhile insisted in a speech on Monday night (August 11) that foreign investments in the zones posed no threat to Islam or Maldivian sovereignty, assuring that the businesses would be fully subject to Maldivian law. The government’s objective was “economic transformation” through diversification – to mitigate the reliance on the tourism industry – and shifting the economy from its “present production frontier” to a higher level, Yameen explained. Yameen had declared in April that the SEZ bill would become “a landmark law” that would strengthen the country’s foreign investment regime. Jumhooree Party (JP) and Maldivian Democratic Party (MDP) MPs boycotted parliament’s economic affairs committee today in protest of alleged procedural violations by the committee’s chair in his haste to complete reviewing the government’s flagship special economic zone (SEZ) legislation. Progressive Party of Maldives (PPM) MP Abdulla Khaleel – the committee’s chairperson – was “repeatedly violating Majlis rules and committee rules as well,” said JP Leader Gasim after walking out of a meeting this morning and raising a point of order at the ongoing parliament sitting. The SEZ law would authorise a board formed by the president “to sell off the entire country in the name of economic zones,” the business tycoon said. He added that the committee was not considering recommendations by state institutions concerning relaxed regulations, exempted import duties and tax incentives. PPM MPs wanted to complete assessment of the bill “like a snap of the finger,” he said. Speaker Abdulla Maseeh Mohamed, however, said he could not accept Gasim’s objections as a point of order and advised the Maamigili MP to submit a complaint outside the sitting. Backing Gasim’s stance, MDP MP Eva Abdulla – who had walked out of the committee with Gasim – contended that procedural violations at committees must be dealt with by the speaker. As the “smallest example” of Khaleel’s misconduct, Eva alleged that the chair was participating in votes while the rules stipulate that he could only cast a vote to break a tie. The chair was completely “disregarding” recommendations and commentary sent to the committee by the Maldives Police Service, Customs Service, Local Government Authority, and Maldives Monetary Authority, Eva claimed. Moreover, the views of JP and MDP MPs were deliberately being ignored, she added. Parties in the minority should be respected, she continued, warning of disruptions to proceedings at parliament sittings if the issue was not resolved. In a second point of order, Gasim said he would not stand for the PPM misusing its parliamentary majority to get its way in flagrant violation of rules. If the SEZ bill is passed into law without revisions, Gasim said the country’s “independence would be lost” and “certain people” would be allowed to carry out corrupt dealings. PPM MP Riyaz Rasheed meanwhile advised resolving the dispute through dialogue in lieu of disrupting proceedings with quarrels in the chamber. Shortly after the second session of today’s sitting resumed at 11am, Speaker Maseeh adjourned proceedings in the face of consecutive points of order raised by JP and MDP MPs. Khaleel had told newspaper Haveeru last week that he expected to complete the review process and send the bill to the Majlis floor for a vote before the end of the month. Parliament breaks for a one-month recess at the end of August. As the bill was a high priority for the government, the MP for Faafu Nilandhoo said he had decided to hold two meetings for every day when there is a parliament sitting. Khaleel had stressed that stakeholders would be consulted and technical expertise would be sought. Prior to walking out of today’s meeting, Gasim advised that it was “very important” to specifying a period for offering tax incentives to investors instead of leaving it to the discretion of a board. In response, Khaleel insisted that he was conducting proceedings in accordance with the rules and that comments that were “not against the spirit of the bill” were being considered. After the JP and MDP MPs walked out, Khaleel continued the review process – with PPM MPs and coalition partner Maldives Development Alliance (MDA) Leader MP Ahmed ‘Sun’ Siyam Mohamed in attendance – and put articles 34 through 48 to a vote after seeking proposed amendments. Reflecting its simple majority in the 85-member house, the PPM-MDA coalition has voting majorities on parliamentary oversight committees. Meanwhile, responding to criticism of the SEZ bill from the opposition, President Abdulla Yameen insisted in a speech on Monday night (August 11) that foreign investments in the zones posed no threat to Islam or Maldivian sovereignty, assuring that the businesses would be fully subject to Maldivian law. Former President Mohamed Nasheed contends that the zones would be used for criminal enterprises, “irreligious” activities such as gambling, and money laundering. The opposition leader had dubbed the legislation the ‘Artur Brothers bill’, referring to an infamous pair of Armenians linked with money laundering and drug trafficking who made headlines last year after they were photographed with cabinet ministers. Foreign investments pose no threat to either Islam or Maldivian independence and sovereignty, President Abdulla Yameen said last night, assuring that the creation of special economic zones (SEZs) was no cause for concern. “It does not mean casinos will be operated in the Maldives, and it does not mean the president would have more power than he should,” Yameen said in a speech at a function held by the Maldives Inland Revenue Authority (MIRA) to celebrate its fourth anniversary. Yameen insisted that foreign investments would be fully subject to Maldivian law while sovereignty would extend to the SEZs. The government’s flagship SEZ legislation – which envisions free trade zones with relaxed regulations and tax incentives – has come under fire from the opposition with former President Mohamed Nasheed contending that the zones would be used for criminal enterprises, “irreligious” activities such as gambling, and money laundering. Nasheed had also argued that the government would have less authority in the SEZs than the authority it exercised in Addu Atoll Gan Island during British occupation. Briefing MPs on parliament’s economic affairs committee yesterday – which is reviewing the SEZ bill – MP Mohamed ‘Kutti’ Nasheed reportedly sought to allay fears that SEZs would facilitate corruption. The ruling Progressive Party of Maldives MP – who was involved in drafting the legislation – explained that the bill includes mechanisms to prevent corruption and take legal action in accordance with the UN International Convention against Corruption. Provisions were included for terminating agreements with investors if an act of corruption is proved, he added. Nasheed also suggested that other issues such as a ceiling for investments and extending incentives to developers in addition to investors could be addressed at the committee stage. Speaking at the committee, Jumhooree Party Leader Gasim Ibrahim expressed concern with the legislation conferring excessive authority to the president, which he warned could be used to favour or “destroy” businesses. The business tycoon, however, said he supports passing the bill with revisions. MP Ahmed Siyam Mohamed – owner of the ‘Sun Siyam Resorts’ and leader of the government-aligned Maldives Development Alliance – urged expediting the passage of the bill as an SEZ law would allow “stalled investments” to resume. Foreign banks were not lending for investments in the country at present, Siyam said, but development banks would be established along with the SEZs. The economic committee’s chair said last week that he expects the review process to be completed before the end of the month, after which the bill would be sent to the Majlis floor for a vote. Yameen meanwhile said last night that the Maldives should emerge from its “small crab hole” into the wider world. The government’s efforts to generate income to create job opportunities and provide education and healthcare was “not a big ask,” he said. The government’s efforts were geared towards “economic transformation” through diversification and fostering a “business-friendly environment” for both domestic and foreign entrepreneurs. While increasing tourist arrivals was “natural economic growth,” Yameen explained that the objective was to “transform” the economy from the present “production frontier” to a higher level. The “main beneficiary” from economic diversification and ‘mega projects’ would be the state, Yameen added, as tax revenue would increase and job opportunities would be created. Implementation of the mega projects – such as the ‘iHavan’ transhipment port – would “transform the economic landscape,” Yameen suggested. The government was also reviewing framework agreements for “avoidance of double taxation” to ensure that “corporate leaders” from neighbouring countries with investments in the Maldives are not taxed twice, Yameen revealed. While the government’s focus was on the economy instead of partisan politics, Yameen stressed that political stability and a low crime rate were among the “basic ingredients” for economic transformation. Reiterating the government’s focus on youth development, Yameen said the Maldives needed to move away from a culture of “criminalisation” of trivial offences to encouraging youth and “giving them conviction” and employment opportunities. The younger generation was “the energy of the economy,” he added. In a speech earlier this month, Yameen point to the country’s “motivated”, “highly intelligent” and “easily trainable” youth as a key resource for economic growth. A delegation from the International Monetary Fund (IMF) has urged MPs to expedite legislation on fiscal responsibility, at a meeting with parliament’s Finance Committee and Economic Affairs Committee on Wednesday. According to the parliament secretariat, the IMF team told MPs that passage of the fiscal responsibility bill currently being reviewed by the Economic Affairs Committee was the most important measure the People’s Majlis could take to improve the country’s economic outlook. A fiscal responsibility bill to impose limits on government spending and ensure public debt sustainability was submitted to parliament in 2011 by the administration of former President Mohamed Nasheed as part of an economic reform package. As measures to legally mandate fiscal responsibility, the legislation proposed setting limits on government spending and public debt based on proportion of GDP (Gross Domestic Product). Borrowing from the central bank or Maldives Monetary Authority (MMA) should not exceed seven percent of the projected revenue for the year, according to the bill, while such loans would have to be paid back in a six-month period. Moreover, the bill proposed that a statement outlining the government’s mid-term fiscal policy must be submitted annually to parliament at the end of the financial year in July. Meanwhile, according to parliament, members of the IMF mission currently in the Maldives are Overall Coordinator Dr Koshy Mathai, Dr Fazurin Jamaludin, Nicholas Million, Dr Nandaka Molagoda, and Jules Tapsoba. Ahmed Munawwar, Manager of the Monetary Policy Section of the MMA also attended yesterday’s meeting. According to the latest figures from the Finance Ministry the fiscal deficit as of November 4 stands at MVR 2.4 billion (US$155.6 million), with government spending of MVR 10.4 billion (US$674.4 million) outstripping revenues of MVR 8 billion (US$518.8 million) so far this year. Of the MVR 10 billion in expenditure, MVR 7.6 billion (US$492.8 million) was on recurrent expenditure – salaries and allowances for government employees and administrative costs – while MVR 1.5 billion (US$103.7 million) was spent on repaying loans and interest payments. The remarks followed the IMF warning of dire consequences if expenditure was not curbed to rein in the ballooning budget deficit. “We are seeing the bitter consequences today of spending out of the budget without any control or limit,” MP Easa had said. Dunn had meanwhile emphasised in April 2012 that “fiscal imbalances in the Maldives have been present for many years” and that “fiscal adjustment remains necessary”. 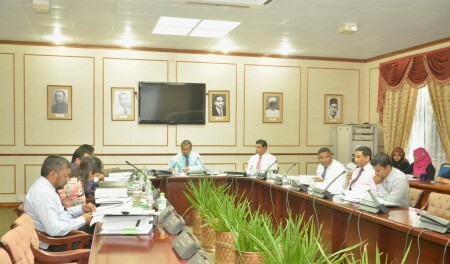 Faced with increasing pressure from the IMF to lower expenditure after failed attempts in 2010 to keep in place unpopular pay cuts for civil servants – a maneuver blocked by the Civil Services Commission (CSC) and backed the then opposition – former President Nasheed’s administration insisted that increased revenue from the new taxes would match expenditure, and boasted that the 2012 budget was the first in many years to balance income and expenditure. Following the police mutiny and controversial transfer of presidential power, spending by President Dr Mohamed Waheed’s administration had escalated as it sought to shore up support in a fractious political environment. Moreover, in September 2012, a pair of government-aligned MPs blamed President Waheed’s lack of solid policies for the increase in state expenditure. The doubling of the budget for the Maldives Marketing and Public Relations Corporation (MMPRC) to US$S4.5 million. The hiring of 110 new police officers.